Hosted by chef, cookbook author, cooking school owner, and restaurant consultant Diane Kochilas, the 13-part culinary series MY GREEK TABLE WITH DIANE KOCHILAS celebrates Greek history and culture through food. In the series, Diane travels throughout Greece and its surrounding islands where she showcases many of the foods that Greece is known for (olive oil, feta, honey, yogurt and more), while giving a snapshot of the country’s traditions. Then Diane heads back to her kitchen to whip up simple home-cooked meals using the ingredients she highlights in each episode, offering tips on how to cook and pair them in a traditional Greek meal. In addition to hosting her own series, Diane, together with her husband Vassilis Stenos, runs the Glorious Greek Kitchen Cooking School on the Blue Zone Greek island of Ikaria. 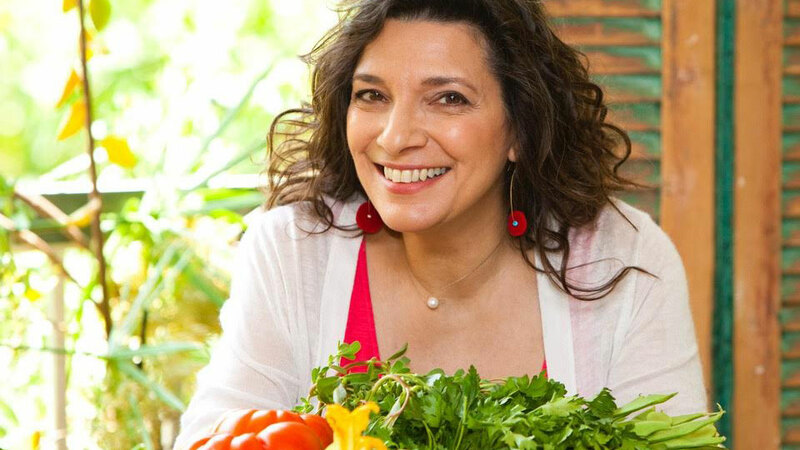 She is the author of 18 cookbooks on Greek and Mediterranean cuisine, two of which, Ikaria: Lessons on Food, Life and Longevity from the Greek Island Where People Forget to Die (Rodale) and The Glorious Foods of Greece (William Morrow) have won IACP (International Association of Culinary Professionals) awards. Diane has consulted for many of the top Greek restaurants in North America and is currently consulting chef at Boston’s Committee Ouzeri & Bar, a meze concept. Diane divides her time between New York, Athens and her family home on the island of Ikaria. Diane visits a small village in Laconia, the Peloponnese, where the famous Kalamata olive is cultivated, to follow the famous olive from harvest to table. After a chilly day of collecting, scoring, and processing the ripened fruits, Diane heads to the kitchen to whip up an olive feast. First up, a dish fit for a Greek hero, Spartan chicken, with those celebrated olives, tomatoes and feta cheese. Next, Diane shows us the simple pleasures of cooking olives with oranges in an easy, elegant appetizer. The olive story doesn’t end there, of course. There’s a delectably spicy cuttlefish and olive dish she cooks up with an olive farmer, and a scrambled eggs-and-olives recipe to turn any light lunch or brunch into a Greek feast. Find out how olives can transform any meal into a masterpiece. Diane travels to her family’s native island of Ikaria, where locals are 10 times more likely to live to a hundred than Americans. Diane’s young 85-year-old neighbors share homemade wine and a lesson in making wild herb teas. A beekeeper reveals the honey that is one of the secrets to Ikarians’ renowned longevity. Diane’s friend Eleni joins her to cook a hearty one-pot summer vegetable stew and savor a rich, plant-based feast. Discover the spirit of Ikaria, which leaves no place for anxiety or life by the clock, but plenty of time for an impromptu dance and a feast for the senses that’s healthy as can be. Enjoy the deliciously simple and wonderfully healthy cuisine of Ikaria. Diane explores the ancient grains that Greek cooks still love to use. Learn how to make the classic Cretan barley rusk (twice baked bread) called paximadi. Seasonal vegetables, green apples and mint add a pop of freshness to an easy bread salad with these rusks. Pasta tossed with Greek yogurt and half a dozen fresh herbs provides instant comfort with a taste that’s quintessentially Greek. Finally, trahana, an unusual grain product made with milk and dried in the sun, turns a simple braised eggplant dish into something exotic and irresistible. Learn how to incorporate timeless ancient grains into every meal of the day. Emerald green Greek extra virgin olive oil is the star of this show, as we watch it flow from tree to kitchen with a stop in between at the massage table. Diane takes us on a journey to the stunningly preserved town of Monemvasia in the Peloponnese. Greece’s liquid gold transforms a simple vegetable medley into a luscious dish and slips between the folds of billowy rice and greens in a succulent pilaf spiked with a squeeze of lemon juice. Olive oil gives dessert a distinct character too. It’s a primary ingredient in halva, an earthy pudding-like creation spiked with dried fruits, orange zest and nuts. Explore the diversity and beauty of one of Greece’s most delectable exports. Diane explores the meze tradition of small plates of vibrant food meant to be shared. In Volos, she meets up with a meze master who creates traditional meze dishes and heads off for a sip and a bite to a cutting-edge restaurant where they push the limits of meze. She uncovers the vast variety and robust flavors of the meze table and invites a wine expert into the kitchen for advice on what to pair when the meal includes spice, yogurt, cheese, crunch, comfort, seafood, meat and more—all in one sitting. The pungent Greek yogurt dip, tzatziki, is the perfect match for Diane’s juicy keftedes, or Greek meatballs. A fiery shrimp dish gets a cooling dash of feta. All make up the mosaic of the meze table, with a few regional cooks’ delights tossed in for fun. Discover the fun and festive meze tradition. Go on a picnic at a vineyard in Naoussa were one grape dominates the table: the local Xinomavro (pronounced xee NOE ma vroe), one of Greece’s noblest reds. This delicious, tannic wine pairs perfectly with a cheese and spice stuffed leg of lamb and is the key ingredient in succulent red wine and sage potatoes. Red wine with fish is on the menu, too. Diane makes an easy sea bass and mushroom dish with a splash of Greece’s revered northern red. On the wine trail, she also discovers bread, cookies and chocolate truffles all spiked with this hard-to-pronounce but easy-to-love Greek varietal. Learn how to incorporate incomparable Greek wine into any menu, both as a drink and an ingredient. Diane travels to Lesvos, one of Greece’s most fascinating and easternmost Aegean islands, where the characteristic generosity of spirit almost won a few locals the Nobel Peace Prize. The crossroads of history play out on the table in Lesvos, where the waters overflow with renowned sardines and shellfish and islanders count dozens of eggplant dishes as traditional fare. Ouzo, the drink of Greek hospitality, fills glasses everywhere in this de facto center of production for the anise-flavored elixir. Diane gets an insider’s taste with a good friend and local son. Then she heads to the kitchen to whip up a taste of the sea: a plate of silvery sardines roasted with a spritz of ouzo and a delectable recipe of braised octopus and black olives. Vegetable lovers will enjoy two unique eggplant dishes, one a stuffed version called “little shoes” and the other an irresistible eggplant patty. Discover the vibrant food and hospitality of the Aegean through its renowned food and drink. Grass-fed takes on a whole other dimension here in Epirus, Greece’s untrammeled northwestern mainland, where sheep and goats graze in the lush green mountains. Here, Diane follows the country’s best-known cheese, feta, from its artisanal roots to modern state-of-the-art production. She explores a range of other sheep and goat milk cheeses that are new to most Americans. Diane visits a shepherd in the villages called Zagorohoria and makes farmhouse cheeses with local friend Vassilis Paparounas. Back in the kitchen, Diane whips up a fiery feta and hot pepper spread, bakes pork with vegetables and cheese in paper, and grills an easy cheese dessert paired with Greek figs. Experience the wonderful world of Greek cheeses and learn how to use them to create an irresistibly cheesy menu. Diane celebrates the intensely flavored food and unique wines of one of Greece’s most breathtaking islands, Santorini. Diane hops in a boat to pick capers on this volcanic island. Back in the kitchen she cooks sea bass with briny capers and a dash of minerally Santorini wine and serves the delectable fish dish with fava, a velvety yellow split pea puree classic in Santorini. She visits a renowned vineyard which still practices the island tradition of growing grapes in basket-shaped vines. A local farmer shows Diane how to make the juiciest tomato fritters from tomatoes that have never been watered. Then, Diane smokes eggplants on a stovetop flame to create a luscious spread with capers and tomatoes. There’s time, too, of course, to savor one of the world’s most celebrated sunsets in full view of the island’s majestic volcano. Enjoy the tastes of Santorini with ingredients from field to sea. Is there a Greek dish more iconic than spanakopita, spinach pie? Diane follows the phyllo flake trail from a New York City diner to the remote Greek countryside to explore the origins of phyllo pies. She’ll prove that making homemade phyllo is a lot easier than it seems and demonstrate how to transform the flaky pastry into a classic spinach pie. Store-bought phyllo is the perfect shortcut for Diane’s deliciously easy chicken pie. The life of pies ends on a sweet note with a heap of torn up phyllo tossed with orange custard combines to make one of Diane’s most intoxicating desserts: messy orange pie. Find out how to use phyllo as a base for an array of dishes, both savory and sweet. Diane visits the source of the well-known Mediterranean diet: Crete. A hearty, soul-satisfying breakfast grain called hondros, or cracked wheat, gives a great start to the day. For a glimpse of village life, she follows a local family’s daily routine of working the land and cooking up a storm and meets an unusual farmer who lives the way people did on Crete a hundred years ago. From picking wild artichokes and asparagus to preparing a simple omelet with wild greens, life’s a celebration of fresh, robust food. This feast is sure to be a crowd-pleaser, featuring vibrant vegetarian stuffed tomatoes and peppers; oregano-infused lamb chops; and giant beans in Diane’s special pesto, a twist on a Greek classic. Learn how to roll up a grape leaf as easy as one-two-three. Diane goes off the beaten path to lush Mount Pelion in central Greece in search of ways to preserve nature’s incredible bounty. Preserves of every kind are the starting point for so many dishes here, from whole apples and almonds put up in sugar syrup to wild pistachio shoots pickled in vinegar. With a bunch of pickled sweet red peppers in hand, Diane makes a hearty local sausage-pepper dish. A foraging escapade inspires a fabulous dish of eggs cooked inside a bed of greens. And, finally, the rainbow of fruit preserves called spoon sweets leads to a delicious cherry-preserve and Greek-yogurt mousse that’s one of those desserts easy to describe as deceptively light. Discover the Greek tradition of sweet and savory preserves that pays homage to Greece’s incredible produce.